So, you may be asking yourself: What is ManagER? What will it do for me? What does ManagER buy us? 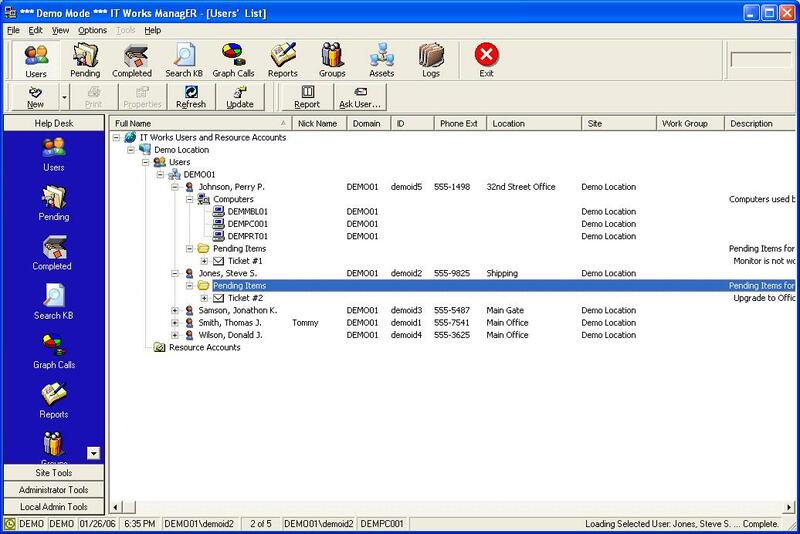 ManagER is a multifunction application designed as a complete systems management tool for primarily managing the Microsoft® Windows® NT family of operating systems. In addition, ManagER supports other operating systems as well as devices other than computers such as printers, mobile phones, hand held devices, projectors, scanners, etc., etc. ManagER's functionality includes System/Asset Management, User Management and Help Desk/Call Center Management, all integrated into one user interface (UI). ManagER is flexible, customizable, extensible and provides the administrators with the ability to customize ManagERs "system" menus to individual preferences and the ability to disable certain menu options to individual preferences. ManagER integrates with Microsoft® Outlook 98/2000/XP for HelpDesk user communications, including service request status and the ability to use Outlook Forms in the collection of User information which can be imported into ManagERs database. ManagER is made of three main components, the User Database, the Computer/Asset Database, and the Help Desk Database; collectively know as the System Databases and Reports. 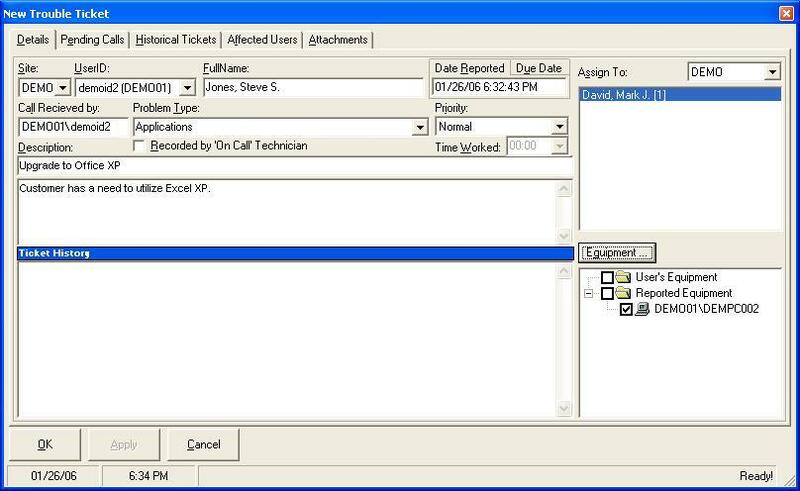 The Help Desk database is integrated with the User and Computer Management databases and provides an Auto-Ticketing feature that creates and completes tickets for registered fucntions. ManagER also has "Quick Tickets" which are tickets that are pre-filled with the ticket details and a solution and all you have to do is select the user that the ticket will be generated against. Functions performed in ManagER share information and combined with the system databases allow administrators to track issues, service requests, obtain data about computers and perform many common computer administrative tasks - all from a single user interface panel. 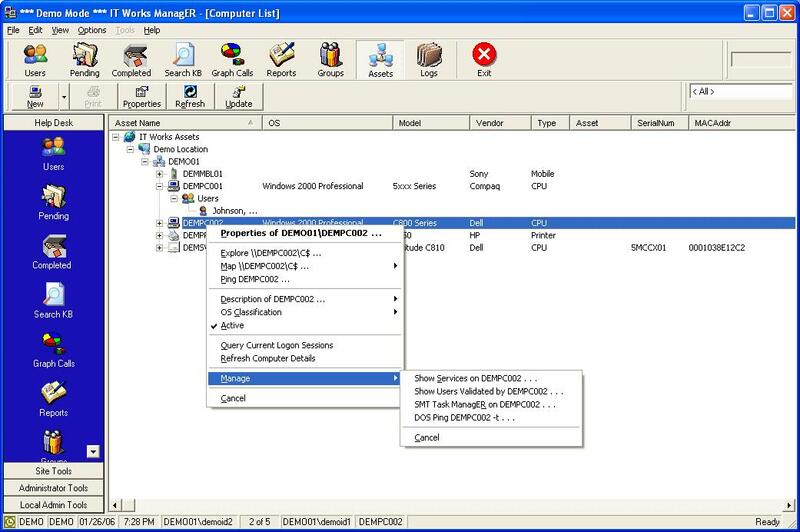 ManagER is the remote administration tool that manages all Windows® XP, Windows® 2000 and Windows® NT computers including computer and user objects within the Active Directory or NT domain environment. The main interface to each of the System Databases is a "tree" styled list that allows you to quickly view the complete list of data items, as well as sort the entries based on almost any data field displayed in the window. Each of the main databases has an individual detailed view and editing form. Add, Change, or Delete actions performed against any item listed within the System Databases will be tracked with a log file entry including the administrators name, date and time, computer used, and a description of the activity. From the user list, you can see the the users basic information, equipment assigned to a user and the user's open tickets and the last 10 closed tickets. You can right click the user or the computer and you will get context sensitive menus for those items and more. The User database contains information for all user and resource accounts to be managed at a site. The database contains active and inactive user accounts as well as other resource accounts. A user account typically has a Network ID (Domain Logon Account) and is assigned to a person or function. A resource account (such as a video projector in a conference room or training room computers) does not have a Network ID. Resource accounts can also include printers, telephones, fax machine, copiers, just about anything that may assist the Helpdesk to provide support and document problems associated with these resources. It is important to maintain User and Resource accounts in the database so that all equipment can be assigned to either a user or a resource account for proper tracking. Also, the association between the User or Resource accounts and a computer improves system management and service support due to the various search options available. If the user name is known, the database can be sorted to show all resources assigned to that user (i.e., a computer, color printer, scanner, etc.) which are located in a particular office. If the user's location (i.e. office number) is known then the database can be sorted to find the user name and computer name assigned to the particular office location. Many ad-hoc queries can be made from the various interface screens including the use of third party query tools directly accessing the ManagER databases. The pending list show open calls. It can list all open or pending calls or just those for a particular Technician. If there are more than 1 person associated with the call (e.g., both reported the same common problem such as the "internet is down"), then the users would be listed under the ticket. All updates are also listed and by whom. The row colors can be controlled by ticket priority (High = Red, Low = Blue, etc). The Help Desk Administrator (HDA) has been designed to allow tracking of User service requests for computer and non-computer related support. HDA will allow the support staff the ability to log a user support request and assign ticket to a staff member including set the priority level of service request. Service tickets are assigned to a particular user who will receive automated e-mail notification messages upon initial ticket creation, modification and completion. All Call Tracking information is maintained in the HDA database and each support entry maintains a historical sequence of actions from the initial call creation entry through the final completion of the service request. ManagER provides four quick-view graphs of completed service requests contained in the database. Each graph is sorted by the administrator that has been last assigned to the service request. The default graphs are: Yearly Service Calls, Quarterly Service Calls, Monthly Service Calls (current year only) and Calls by Type. Each graph can be viewed in full screen by double clicking on the desired graph as the information can be difficult to read depending on the data points to be displayed. To revert view to the four-way screen, simply double click on the full screen graph. perform maintenance functions to these computers. Domain computers can be imported or updated by using the main menu option: File->Import/Update from the Domain->Computers. Computers that do not exist in the database will be added (imported) while computers currently existing in the database will be refreshed with information that has changed in the domain. Non-Computer items such as Unix/Linux servers, docking stations, monitors, external storage devices, etc. can also be manually added to provide added value for equipment inventory management. Information contained in the Computer Database can be edited by synchronizing the Domain Values using the Import command or by manually editing the fields directly in the Computers panel.. Remote Computer Administration is a central feature of ManagER and is enhanced by the ability to right click on a computer and have a menu of tasks displayed that can be performed on or against a remote computer. Remote administration provides the ability to perform most, if not all, maintenance activities from one computer without having to manually visit a desktop. 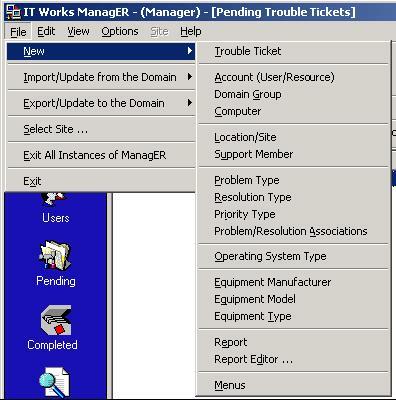 Each menu has a default view of the most popular functions that a helpdesk administrator may perform based on the type of object, the site, and the OS of the remote computer. The menus may be customized using the process described in the Modify ManagER Menus section of this document (Chapter 5). The menus are divided between fixed and custom options. 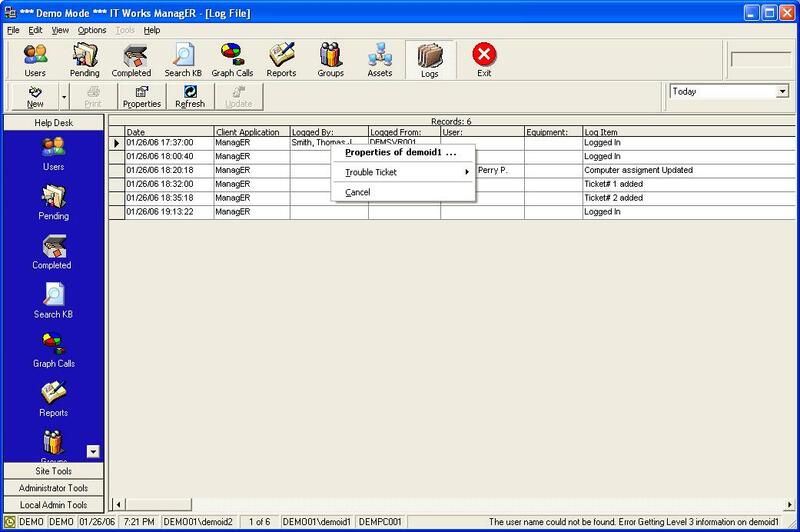 The Log database is designed to record all administrative changes and actions using features and options within ManagER. Actions that have been taken using ManagER can be viewed by selecting the Logs icon. ManagER will log transactions such as: User Loggin to ManagER, User creating or modifying a HDA ticket, Explore users home drive, Modify a system menu, View services on remote computer, etc. Any action other than viewing existing data will be logged in the database. Manager has many components that can be customized to a specific site/environment or a particular administrators duties. Customization options include changing the menus, adding additional information Types, adding additional equipment information, etc. The customization options can be found by selecting File->New on ManagERs menu bar.